A selection of different types of wall mounts provides versatility, allowing you to mount your television virtually anywhere in a room. So whether you’re looking to fit your TV into a smaller space, or can only view your TV from a specific area, there’s definitely a mounting solution that’s right for you. Here we explain what you can expect when purchasing a TV wall mount, as well as the difference between fixed TV wall mounts, tilting TV wall mounts, and full motion TV wall mounts, the benefits of each, and which might be best suited for your space. 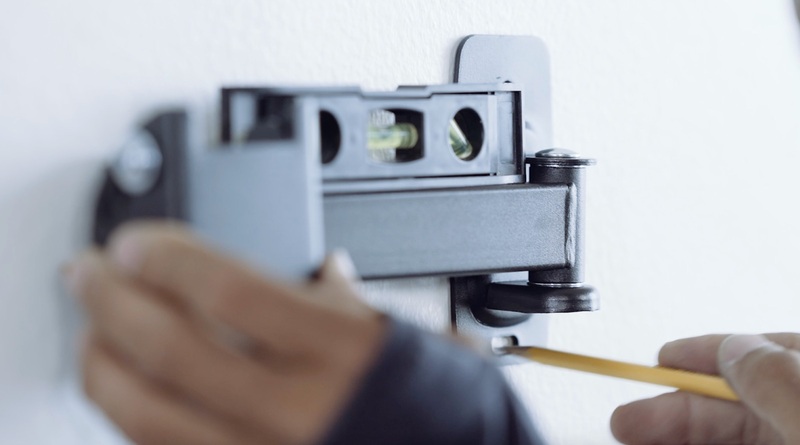 Most TV wall mounts provide the basic materials necessary to get your TV fastened securely to your wall. You’ll find screws intended for use with studs, drywall anchors for use in case there are no studs in the location where you’d like to mount your TV, and/or snaptoggle anchors, which can help you mount your TV into plaster or other wall materials – but even if some of these items are missing from the box, they’re all readily available at your local hardware store. Almost all televisions sold today comply with the Video Electronics Standards Association (VESA) format for TV wall mounts, which means that you shouldn’t have to worry whether or not your mount will fit onto the back of your television – any mount should fit on nearly every TV. 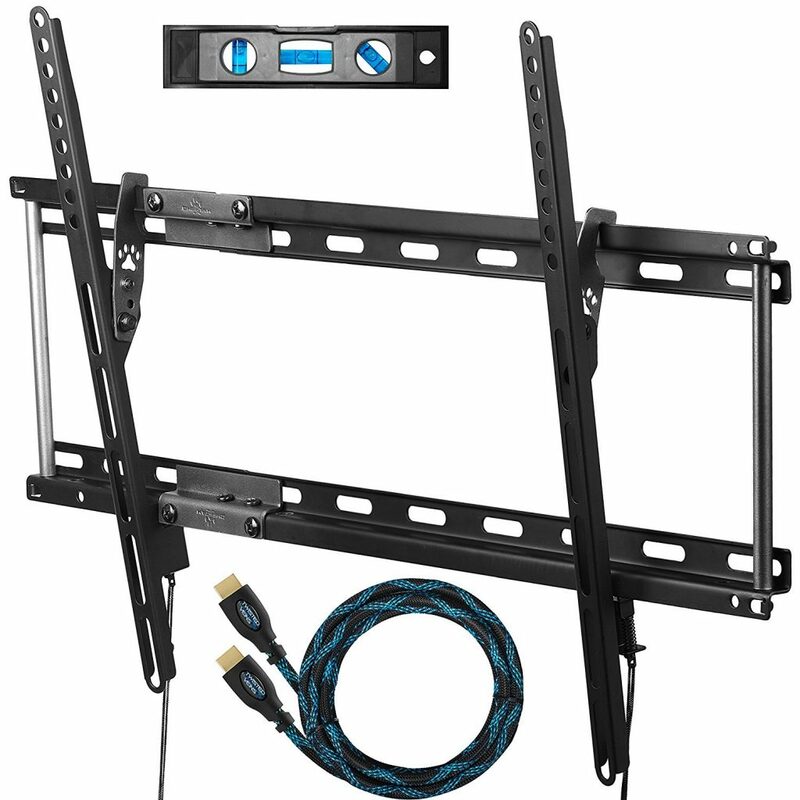 In addition, fixed mounts and tilting mounts are often adjustable for screen size, allowing them to hold different sized TVs from 19” up to 65” – provided that they can support the weight of the television. Always check the product specifications of the TV mount you purchase to ensure it can support the weight of the TV you intend to mount. Sanus Accents Fixed TV Mount. Credit: Target. 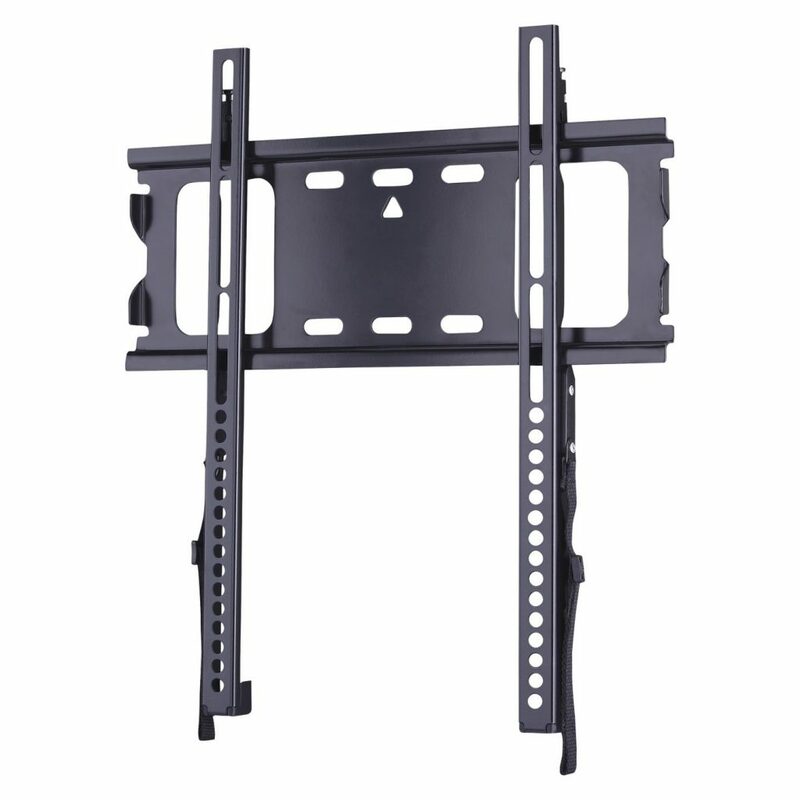 If you know that you’ll be mounting your TV exactly at eye level – often around 42” off the ground – you won’t be moving your TV, and you don’t need to access the television’s ports very frequently, a fixed TV bracket might be the best choice for you. They sit nearly flush with the wall, are easy to install, and are the most affordable of mounting bracket types. If you’re in doubt about how to determine where your eye level will be when mounting your television, check out our post about finding the best height to mount your TV. Cheetah AMPTMM2B Tilted Mount. Credit: Target. A tilting TV bracket is a great option if you’ll be mounting your TV over a fireplace, in the bedroom, or somewhere in the room that’s above eye level. With the ability to tilt your TV screen downward nearly 45 degrees, a tilting TV wall mount allows you to get an optimal viewing angle without having to crane your neck to see your TV. It also works extremely well to counter glare and reflections from ambient light sources such as windows or lamps. When not in use, a tilting bracket can also be set nearly flush with the wall for a slim, clean look. 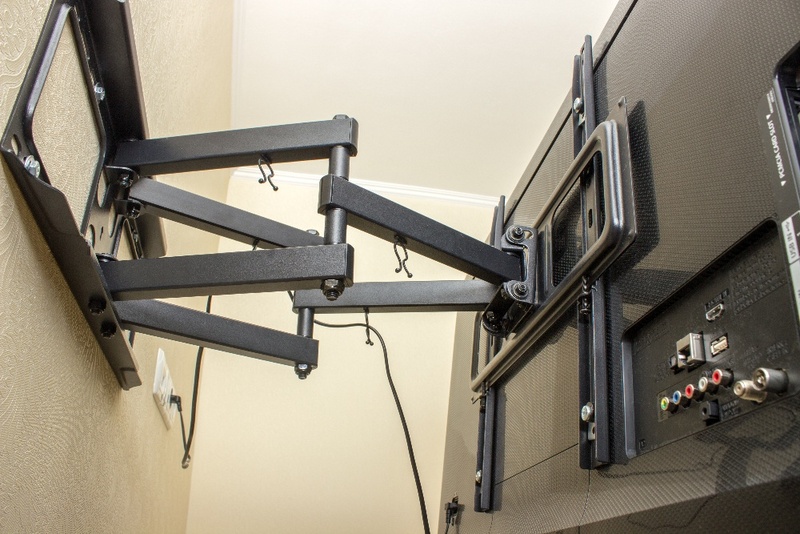 The full motion TV mount provides the most versatility due to its multiple pivot points which allow you to extend, tilt, swivel, and even rotate your TV. This is especially helpful if you want to mount your TV in a corner or recessed space, which, when extended, can give off a “floating TV” effect. A full motion TV bracket is also great if you like to view your TV from multiple seating areas in a room, and can also be used to avoid glare as well as access your TV’s ports and cables. And, when you’re done viewing, you can simply push the full motion TV bracket flat against the wall again. Have a particular TV bracket in mind? Puls technicians can bring your desired TV bracket size and type to you with which to mount your TV – and do all the drilling, lifting and technical configuration for you, so you can simply sit back, relax and get ready to enjoy your newly mounted TV. We can even help you conceal wires, mount shelving and sound bars, or hook up devices like your XBOX. 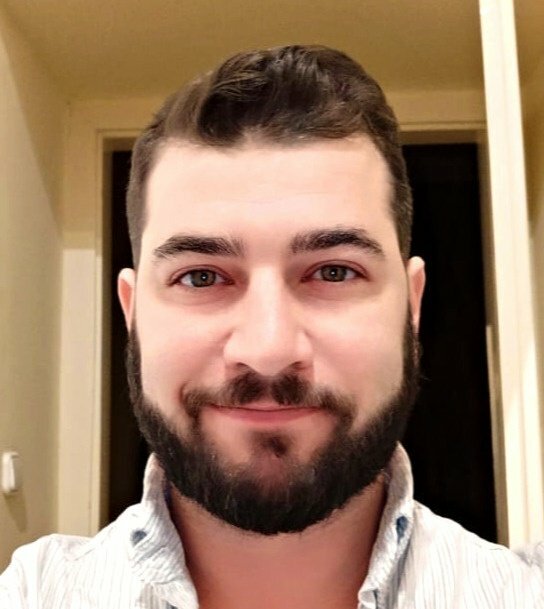 Simply hop online and book an appointment with our expert technicians at a time that works best for your busy schedule. We can be there within the same day to make things as seamless and convenient as possible.